The cast members of 'Running Man' channeled their inner BTS on the latest episode of the program. On April 14 episode of SBS' variety show 'Running Man', the cast members had to clear a mission of covering K-pop boy group BTS' hit-song 'IDOL'. The seven members made an utmost attempt to master the ever-so-difficult dance moves but it seemed like it is definitely not easy for them. They immediately began teasing each other about not being able to perfectly cover the choreography, especially the oldest member Ji Suk-jin being the "black hole" as he kept making mistakes and missing the tempo. In the end, Yu Jae Seok picked JIMIN, HaHa chose V, Song Ji-hyo chose J-HOPE, Kim Jong-kook chose RM, Ji Suk-jin chose JIN, Yang Se-chan chose SUGA, and Lee Kwang Soo chose JUNGKOOK. After several tries, the seven cast members managed to cover the dance to 'IDOL'. 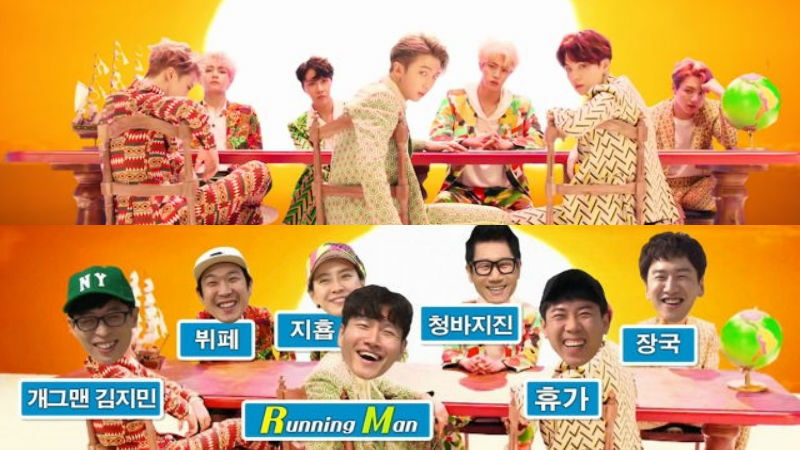 You can watch the clip of 'Running Man' below.